Normally built at the rear of a property, but sometimes at the sides or front (with planning permission required), a dormer loft conversion delivers substantial improvements to the floor and headroom in your loft. A dormer transforms a dull, non functioning space into something special. Whether you’re looking for a new family room, an office, gym or games room, a dormer could be the perfect option for you. What Does a Dormer Look Like? 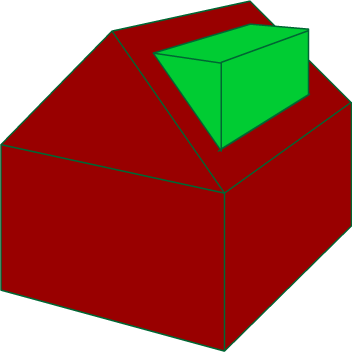 A dormer extends and protrudes from an existing roof slope and can be built in a variety of styles, designs and dimensions. They’re ideal for properties with reduced loft space and can add considerable monetary value to your property. Think: horizontal ceilings, vertical walls – a brand new, usable space in your home. Most dormer loft conversions are flat roof but you may wish to consider other styles such as a hip roof conversion (ideal for detached or semi detached homes), gable fronted (sometimes known as a dog-house dormer) or a shed dormer. 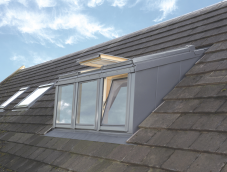 A dormer eliminates the need for Velux type windows entirely and often adds more open space and headroom with plenty of natural light. A Velux conversion will be more affordable but you will need to live with the sloping ceilings and perhaps your space is at a premium. A dormer loft conversion involves the roof and floor being opened up or even raised to give a terraced appearance – lots more usable space! Contact us to discuss your options.